Hundreds of thousands of PROPLUGS are in use today to protect children. After ventilation tube operations on the ears, shampoo and soap lower surface tension and allow dirty water to pass through ventilation tubes infecting the middle ear. Doc's Proplugs help prevent this from occurring. 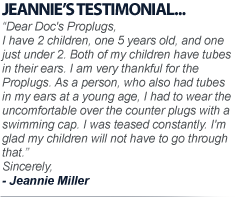 Proplugs are designed to be non-invasive and our time tested earplugs are inexpensive, long-lasting, and ready-to-wear. Plus, they can be quickly and easily fitted. 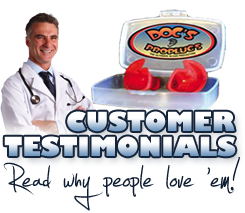 Doc's Proplugs are made of soft, hypo-allergenic Dynaflex with memory that provides a watertight seal. Eardrum Damage: Solid (non-vented) Proplug earplugs are recommended for individuals who are likely to forget to stay on the surface of water. Without ear protection, ruptured eardrums are likely to cause pain and further complication which may lead to surgery. Tympanostomy Patients: Patients with Tympanostomy should refrain from going underwater. However, Doc’s Proplug earplugs should be used to protect inner ear during showering, shampooing, and any exposure to water. Frequent Ear Infections: For frequent otitis externa (swimmers ear) or otitis media (middle ear infection), solid proplugs and vented proplugs prevent water from entering the canal. The unique design of the Proplug does not disrupt the canal which leaves the delicate canal skin uninjured and keeps earwax in tact. Earwax, as doctors will contend, is a natural defense to bacterial agents in the ear.